Looking for the best 2018 Black Friday & Cyber Monday Canon EOS 77D deals, sales, rebates and specials? Here is the buying guide for you! Featuring a 24.2MP APS-C CMOS Sensor, DIGIC 7 Image Processor, Dual Pixel CMOS AF, up to 6 fps Shooting, 45-Point All Cross-Type Phase-Detect AF, Full HD 1080p Video as well as built-in Wi-Fi with NFC, the Canon EOS 77D is a well-rounded and well-sorted camera which is ideal for both still photography and video recording. In addition, the Canon EOS 77D achieved a great 82% overall score and Silver Award from the experts at DPReview, and it is suggested for “enthusiasts and amateurs who are looking to take more control over their photography, and those looking to capture video with ease”. So, if you are interested, just get it this holiday shopping season! $150 off on Canon EOS 77D Body: $749 at Amazon, B&H, Adorama. 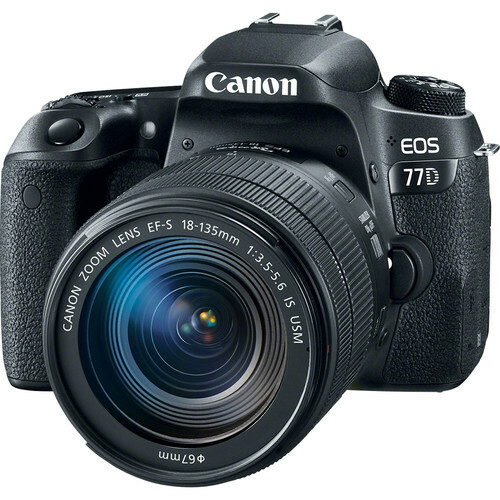 $250 off on Canon EOS 77D with 18-55mm Lens: $799 at Amazon, B&H, Adorama. $350 off on Canon EOS 77D with 18-135mm Lens: $1,149 at Amazon, B&H, Adorama. $400 off on Canon EOS 77D with 18-55mm and 55-250mm Lenses Kit: $948 at Amazon, B&H. $500 off on Canon EOS 77D with 18-135mm and 55-250mm Lenses: $1,298 at B&H. See more: Canon Black Friday Deals. Read more: Canon Black Friday 2018.